Carbohydrates containing starches get a bad rap from low-carb diet proponents for being higher in calories than nonstarchy carbs like green vegetables. Your body also digests starches more quickly than protein or fat. But many starches contain rich amounts of nutrients like B vitamins, which help you make energy from food, and fiber, which keeps your digestive system running on track. Keep your starchy carbs healthful by choosing nutrient-dense varieties over refined ones, monitoring your portions and avoiding high-calorie additions. Use a calorie counter app to monitor your carbohydrate intake. Carbohydrates are one of three macronutrients your body needs to function, along with protein and fat. When broken down and digested, carbs turn into glucose, your body's preferred fuel, needed for tissue and muscle health and for all the major bodily systems. The Institute of Medicine recommends that 45 to 65 percent of your daily calories come from carbs. Carbs are often classified as either simple or complex, depending on their composition. Sugars count as simple carbohydrates, since they might contain just one or two subunits, while starchy carbs fall into the category of complex carbohydrates because they can contain hundreds or even thousands of smaller subunits. However, these names can be misleading. Fruits have "simple" carbs, but contain essential vitamins and fiber; at the same time, some starches, like white bread, are technically "complex," but most of their natural nutrients like fiber have been stripped out during manufacturing. Without the benefit of fiber to slow digestion, refined carbs act much like simple sugars, digesting quickly and leaving you feeling hungry again soon after consuming them. Your best bet in picking starchy carbs is to stick to those in whole foods and to steer clear of refined carbs like white bread, pasta and rice; processed baked goods; snack foods made from starches, like potato chips; and many ready-to-eat breakfast cereals, like cornflakes. Go instead for fresh veggies, whole grains, beans, legumes and other carbs in their most natural form. Potatoes and potato products are the starchy carbs that may spring first to your mind. But other so-called root vegetables -- those that grow underground -- also fall into this category, including sweet potatoes and yams, parsnips, jicama, taro root, water chestnuts, Jerusalem artichoke and rutabaga. Carrots, beets, turnips and daikon radishes contain starches, too, but less than other root veggies. Winter squashes count as starchy carbs, as well, including pumpkin, butternut squash, Hubbard squash, acorn squash and delicata. Corn, both on and off the cob, is also a starchy carb. Registered dietitian Joy Bauer suggests keeping your portions of starchy vegetables "moderate" and to avoid high-calorie add-ons because they are higher in calories than nonstarchy veggies. For example, a 100-gram serving size of cooked broccoli comes in at just 35 calories and 7 grams of carbohydrate -- about 3 grams of which are starch -- while the same amount of baked potato is 97 calories and 21 grams of carbs, about 18 of which are starch. Slathering butter, cheese, bacon bits or sour cream onto your potato pushes the calorie count even higher. Grains are starchy carbs and include flours and grain products, like bread, crackers and pasta, made from them. The term "whole grains" refers to those that still contain all three parts of the original grain seed -- bran, germ and endosperm. Common varieties are amaranth, barley, buckwheat, bulgur, popcorn and cornmeal, millet, oats and oatmeal, quinoa, brown and wild rice, rye, sorghum, teff, wheat and wheatberries. 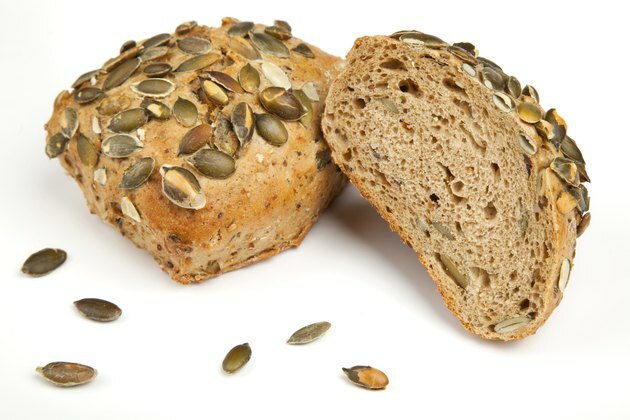 To ensure you're getting the most nutrient-dense grains when you buy prepared breads, pastas, tortillas and other grain products, look for the words "100 percent whole grain" or "100 percent whole wheat" at the top of the ingredients list. Phrases like "multi-grain" and "100 percent wheat" do not signify whole grains. Again, portions are important when you're serving grain foods, and overdoing it can lead to weight gain. A serving of pasta, for example, is just 1/2 cup, instead of the heaping plateful most Americans are accustomed to. Beans and other legumes also make the list of starchy carbs. Adzuki, black, mung, fava, garbanzo, kidney, lima, pink, pinto and white beans like navy and great Northern fall into this category, as do all varieties of lentils. You may think of peas as vegetables, but they're technically legumes, and in their many configurations -- green, split, yellow and black-eyed -- they qualify as starchy carbs. Nuts and seeds contain starch, too, although some much more than others. For example, a serving of cashews is much higher in starch than Brazil nuts or walnuts, which contain almost no starch; and sunflower seeds supply significantly more than tiny sesame seeds. Why Is Starch Good for the Body?